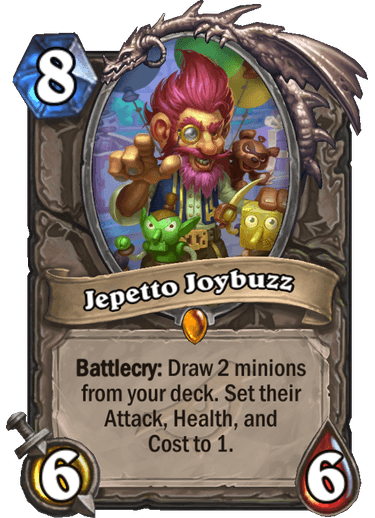 Jepetto Joybuzz is a 8 Mana Cost Legendary Neutral Minion card from the Rise of Shadows set! Rating: 3.8/5. From 219 votes. An insanely powerful card in theory. The biggest issue right now is that the effect is too inconsistent; it could only be used in a deck containing alternate win conditions in addition to just playing jepetto for 1-mana malygos (or similar). At present I don’t think there are enough of such cards to make such a multi-combo deck viable, but this is definitely a card to keep an eye on in future expansions. This is going to fit good in my battlecry deck where I don’t care about stats on my minions! I don’t understand why people are rating this card 4 or even 3 stars. It’s 4 stars at best if you actually got maylgos or prophet, but the chance of that is very rare. And 8 mana for only a 6/6 is crap. The battlecry is awesome but the problem with this card is how inconsistent it is. You’re not gonna pull out a powerful minion every single time. It could work 100% with mechatun, by drawing all your cards, reducing the cost of mechatun to 8 with 2 galvanizers and then playing baleful banker and playng jepetto joybuzz and then playing a 1 mana spell that deals damage to your mechatun. It will take a long time but this is the only way this card can see play, at least from the top of my head. The card has a really cool battlecry but the inconsistent is just overweight the op battlecry. 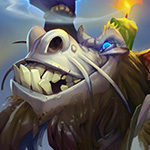 I hope the random nature of Jepetto Joybuzz can prevent it from enabling some stupid combo reliably and instead see play in decks that play a couple handfuls of high value minions where most of that value comes from its battlecry like Alexstrasza or Emeriss or Deathrattle like Mechanical Drake or Grizzeled Guardian. It is a cool card, and I really hope it finds a decent home in Standard. Value combo not otk combo it’s too unreliable for that. Could find a spot to pull brann Zola kazakus nome kreul rat lord gofrey nzoth only cards that are already played. Warlocks the example there but it’s more likely to be played in a deck that’s short of draw like mage because 8 mana 6/6 draw 2 cards isn’t too bad at all. There you have the new 10 mana dragon etc. Rogue is the only one that could make a reliable otk out of this through malygos due to togwaggles scheme the only requirement is to mill down your deck which rogue tends to do anyway combo this with a shadowstep replay and you’d have 4 1 cost malygos in your hand. However there is merit for a priest combo due to the spirit of the dead you just need a way to kill the 2 1/1 in same turn play them and the spirit meaning those 2 card will appear again later as 1 cost full power. And you thought you hated Barnes? Just wait. This cost 8 and playing it interferes with the rest pool if you played Barnes you won’t wanna play this also the summon copy cards would have 2 possibly do nothing pulls. This is not going to replace Barnes in a wild Rez priest. The decks that can make use of this are rather specific and require build around. A few I can think of are Maly rogue, spirit priest, a few battlecry intesive decks like pogo rogue which is the really frightening synergy. Mechathun decks would have this as a side card in case it’s still in the deck. 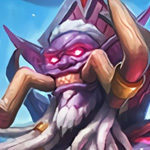 Hakkar would be interesting with it if you built deck around him. While the effect looks flashy and scary, this probably won’t be that great. Luna’s Pocket Galaxy has a similar effect and already proves how inconsistent this type of effect is. For Maly Rogue, good luck surviving to turn 8 in a class with limited board clears, let alone surviving until turn 10 to shuffle more Malys into your deck to pull them out with this card. Priest will not be able to guarantee hitting Velen or Maly with this and it’s ways to shuffle them back into the deck (like the spirit) have negative synergy with this card. Now certainly there will be Trolden clips of this card doing absurd things, but there’s no way it will be consistent enough to be a real player. Prediction: At least 25% of the most cancerous decks in the new meta are going to run this. The problem with cards like this is that they’re challenges in the deck design department, but once one person figures out a killer deck, everyone else just copies it, skipping over the fun part. Playing with or against those decks is then usually less fun than ones that deal damage or acquire board control more organically, because you can’t meaningfully interact with the opponent’s hand, only with what they’ve put into play… combo deck vs. combo deck is kinda two-player solitaire. Obviously a wicked good combo enabler, but the challenge will be making sure you don’t draw your combo pieces before you draw this. Or finding a way to shuffle the pieces back in- which, mind, will require an extra turn or two spending all your mana, which means not being able to defensively handle your opponent’s board. For precedent, this is part of why Luna’s Pocket Galaxy never became part of a combo deck. Plus it’s hard for most classes to find the mana discount needed to shuffle back the best combo cards right now (Malygos and Mecha’thun), so it’s not that easy to design failsafes when you’re using Gepetto. This guy is not an unstoppable combo machine, and even if it turns out to be oppressive there’s always Mojomaster, so I’m not too concerned. New Meta: The Great Turn 8! Can you defeat the evil combo decks before turn 9? 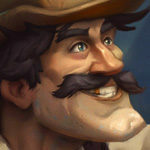 Find out in hearthstones latest expansion! emerged. This sinister plot strikes against the forces of control without the need for stall. And from the shadows a new challenger rises, one that makes you shudder at his power, which once again becomes unlimited!!!!!!!! I agree, this card should give us a few more turns of leeway. 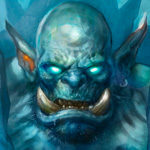 Blizzard should increase its mana cost by 3 and raise its stats accordingly, then it would be perfect! I’d see this would see the most play in rogue otk wise due deck shuffler cards for consistency priest velen mall would require NOT drawing them before you play this, even then it may not be guaranteed because it’s harder to build deck around a low minion count in standard now. 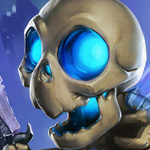 Mage has the blastwave synergy and shaman has possible setup with battlecries however shudderwock would also replay this battle cry meaning 4 of your minions will be 1 cost 1/1. Which can be a big downside. However this would be a good card to play with deathrattles in deck how about a 1 Mana hakkar or 1/1 eggs. you can paly a beleful lbanker and just copy velens even without the mally. I don;t know why you hate mally so much. He is just the weaker version of velen. And velen is not going anywhere. Not is archmage antonidas. 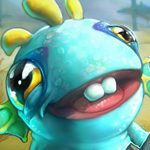 You got lunas pocket galaxy anyway so its not that big of a deal for mage to have 1 mana antonidas. witchwood pipers are a thing so you deffinately can makesomething consistently work if the rng is in your favour. as mally is with higher cost than this. You can almost guarantee yourself some way to draw your exact cards. And get an eurica or w/e as a failsafe. A 1-mana Archmage Antonidas won’t let you kill your opponent from full health in a single turn though, not with Simulacrum and Molten Reflection rotating out of Standard. i was speaking about wild They are kind of retiring the quest OTK with something that is brewing to become more powerfull. Like it wasn;t enough that if I play priest I insta lose againts OTK mages. I think it was worth the mentioning since a lot of the mage decks in wild especially the old oTK decks are still there. Freeze mage from the past is still a thing with alex ice lances thalnoses, The quest thing is there if you want to loop antonidas. There sre very few people that want to play the year of mamoth leyline elemental OTK. And this yers we are getting some sort of pocket galaxy crap. I can smell it. Maybe a rogue deck that shuffles malygos and stuff would work with this. Either way will probably be worth running in minion based combo decks. This card makes me mad. Just why… i loved the expansion so far. 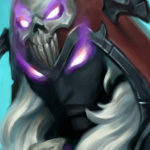 Maly Velen gg. Mad. Aren’t the chances pretty high that you’ll draw one of the mentioned cards by turn 8? Even if not, you’d have to draw this single legendary. idk, I’m not overly frightened when I look at this card. Its okay, maybe powerful but not meta defining. Combo decks are back! Did you miss them? I sure as hell didn’t. Maly Druid: Play this, get Malygos. 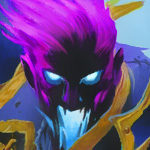 Or if you didn’t get Malygos, Floop Jepetto to ensure you do. If you drew Maly first, you can still play Jepetto to get a 1-mana Floop. Whichever way, you end up with a 1-mana Malygos, which you then combo with Double Swipe + Double Moonfire for lethal. OTK Priest: You need to hit either Velen or Malygos with this. Next turn, you play your 1-mana combo minion + Vivid Nightmare + Double Mindblast = Lethal. Not trying to be offensive, but if you are triggered that easily, maybe HS isn’t the best game to play for you!? 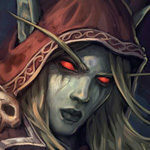 If this card will be overpowered, Blizzard will nerf it – they have shown us recently that they are reacting more promptly nowadays. I’d say just wait how the new expansion (and metagame) pans out before declaring to quit HS? It’s not about power level, it’s about playstyle. Playing against combo decks is the opposite of my idea of having fun. The games always play out the same way, which means the matchups become really old, really quickly. It’s also about polarized matchups. 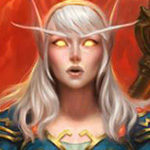 If you’re control warrior and you match up vs. Mecha’thun Warlock, what’s the point of even playing out the game if you have no chance of winning? Skill and decision-making and randomness should contribute to give you a fighting chance, but if you’re a control deck and you get matched up against a combo deck, then you’re just screwed. As someone who enjoys playing control decks and has a lot of fun in control mirror games, I resent combo decks for crowding out control decks, as they did in the Year of the Raven especially. Balance-wise, of course I could just play aggro or combo myself. I don’t enjoy those playstyles, though. If Control mostly isn’t viable again, I’d rather not play at all. everyone has a preferred style, i like a combo/control mix and cannot stand playing as aggro decks. been using shudderwock since its release and when it got nerfed i found a new way to work the strategy using stealth mechanics. Yeah, and it’s entirely fair for people to enjoy playing combo decks. It’s a game, and we’re all trying to have fun. At the same time, I think it’s unhealthy for the game when powerful decks have a very repetitive playstyle. 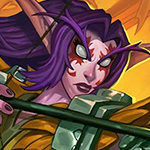 Many people flock to powerful decks regardless of playstyle, and when all games with and against that deck play out very similarly, that makes the game less fun- like how games with an Odd Paladin always revolve around their hero power. Combo decks also have this problem. 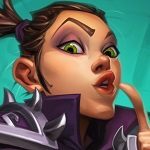 If some people love to play Quest Mage even though it has a low winrate, then good for them! 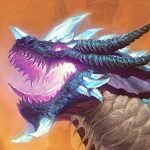 If tons of people are playing Malygos Druid because it has a high winrate… then I think that’s not good for the game’s play experience. But … you know … that’s the very nature of card games. Different types of decks, and some of them are better than others. 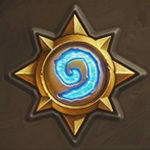 Due to Hearthstone’s concept of low interaction, it is very easy for combo decks to reign supreme, especially if there are no cards like Dirty Rat around. But even if there is interaction (I’m looking at MtG here), there are times when the best deck is an aggro deck or a control deck or a combo deck. Anyhow, I’ll repeat my statement: Wait for the metagame to develop before ‘doomsaying’ the end of the world and enjoy the reveals! 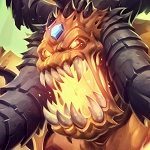 Another thing you can do is draw powerful Battlecry, Passive or even Deathrattle Minions such as Jan’Alai or Shudderwock for example, and then drawing them back with Youthful Brewmaster. A Win-Win, right? Eeeeh kinda. Because although this is a Heavenly good card in terms of Value and a lot of Control Decks, other decks out there will not have as much value as as they would want to imagine, (expect for maybe Secret Hunter but that’s all i can think of as of right now), but those decks are for Ramp Decks, or Big Minon Decks, or even some or few Miracle decks out there, where you’re drawing out a lot of cards out of your hand. The way on how I see this card is that it favors the most for Mage, because You’ve got a Lot of Cards out there that is going to give you Value for your Buck: Toki, Malacrass, Arugal, Antonidas and even Astromancer are some of the Big Boys (and girls) that Mage can use for a 1 mana 1/1 version since they are used more for their value than they are for thier stats. 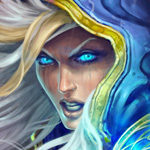 Now of course other Classes can use Jepetto just as well as Mage, Maybe even better, But all I can see is: Control Mage, and: Control Value Mage. Now I’m not too sure how Midrange Decks are going to like this, but It’s deferentially a card meant for slower decks, I would say. I’m struggling to see how this could work consistently. Looks like a meme card designed for highlights on youtube, not for actual competitive decks. 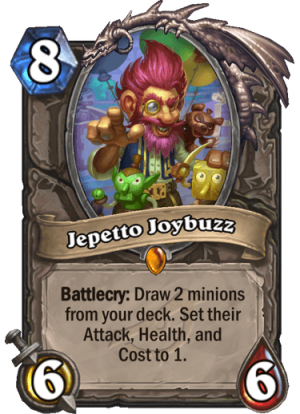 The dream of having Malygos, Velen, and other finishers in hand at 1-cost is tempting, however, Jepetto Joybuzz will surely be a buzzkill a lot more times than it being beneficial. At turn 8, you would’ve drawn your answers already. At turn 8, the game is at a critical point wherein you would want to play a card which impacts and increases your chances to win, rather than setting up what could’ve been with a Taunless 6/6 body. However, with the proper deck building, this card is amazing! Cards that shuffles cards back to your decks exists – and can be a nuisance with Joybuzz as long as you have enough stall in your deck. It is really hard to rate such a card due to its restrictions, but hey, just landing a minion with a good enough battlecry or deathrattle is already okay, as long as your Face is still sitting pretty and healthy. Hi Velen, hi Maly, bye enemy. Can see play with big deathrattles, like Oblivitron we saw some days ago! 8 Mana is A LOT. 6/6 for that is close to be okay. Compared to the discount of your drawn minions totally insane. Not sure about this card. You have to consider that you maybe already have the minions in hand you needed to discount for a combo. You need an insane particular deck for this. Otherwise ist trash. I am thinking Mechatun combo maybe? Or maybe in a new type of exodia mage without the quest? 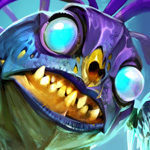 I choose the minions drawn to be Maly and Prophet thank you.